Ships tomorrow if you order in the next 17 hours 4 minutes. Chaga, classified as a mushroom and hard as wood, grows on trees and is the most nutritious of all tree growths. Sometimes called the "Gift from God" and the "Mushroom of Immortality," Chaga is known for its nutrients, which come from the trees it grows on. These nutrients promote a strong immune system. Full Spectrum Chaga by Planetary Herbals is packed with multiple B vitamins, minerals, flavonoids, and enzymes, all of which enhance immune system function. Chaga has been considered a "longevity factor" by the ancient Chinese and Siberians because of its potent antioxidants and minerals. Take 1 tablet three times every day. Feel the power and life of the trees work to give you optimal immune system health. 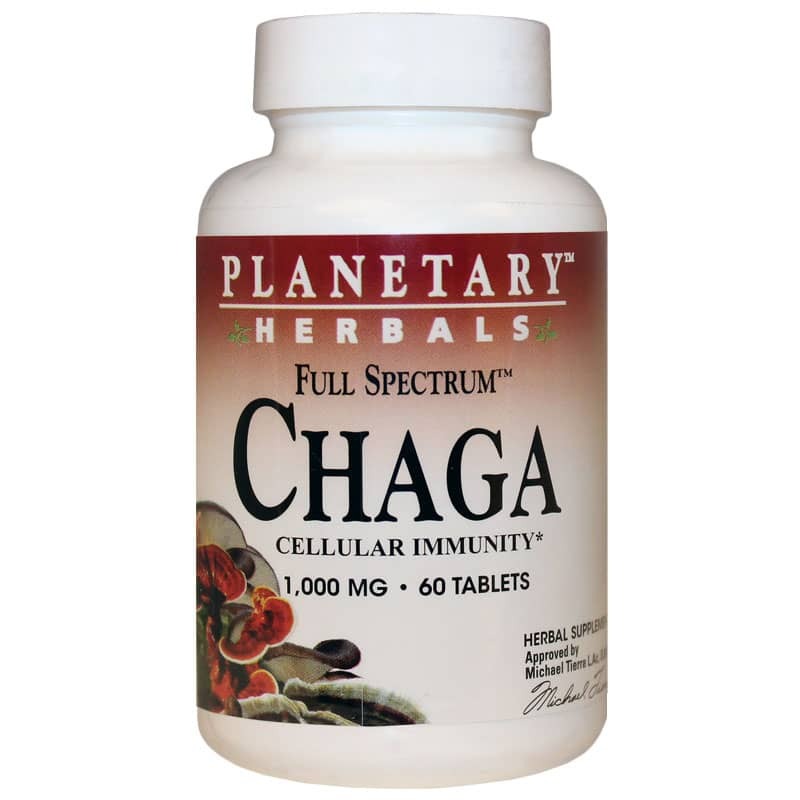 Try Full Spectrum Chaga from Planetary Herbals today! Other Ingredients: dibasic calcium phosphate, stearic acid, acacia gum, maltodextrin, microcrystalline cellulose, silica, and modified cellulose gum. Adults: 1 tablet three times daily. If you are pregnant, may become pregnant, breastfeeding or are taking immunosuppressant medication, have had a transplant or have any glucose metabolism disorder, consult your physician before using this product. Do not use if either tamper-evident seal is broken or missing. Keep out of the reach of children. Store in a cool, dry place.